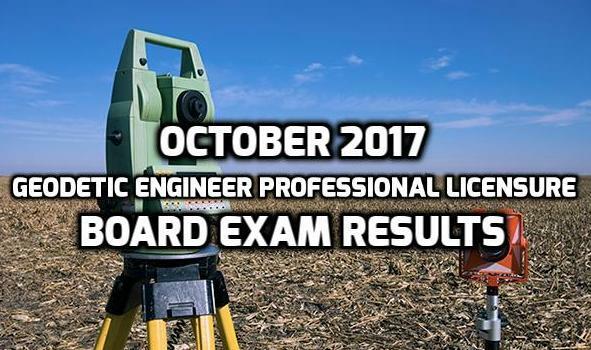 The result of the October 2017 Geodetic Engineer Professional Licensure Board Exam is already released by the Professional Regulation Commission (PRC) on Monday. According to the commission, 750 applicants took the board examination on October 25-26, 2017and 372 passed successfully. The Board of Geodetic Engineering administered the scheduled licensure headed by Chairman and Engr. Epifanio D. Lopez. The other board members who assisted him include Engr. Randolf S. Vicente and Engr. Concordio D. Zuniga. The test centers for the recent board examination is in Cebu City and Manila. From the information published through the official website of the commission, all the passers need to register beginning on November 3, 2017 for the Professional Identification (ID) and Certificate of Registration issuances. It is important that they visit prc.gov.ph for further updates and inquires.